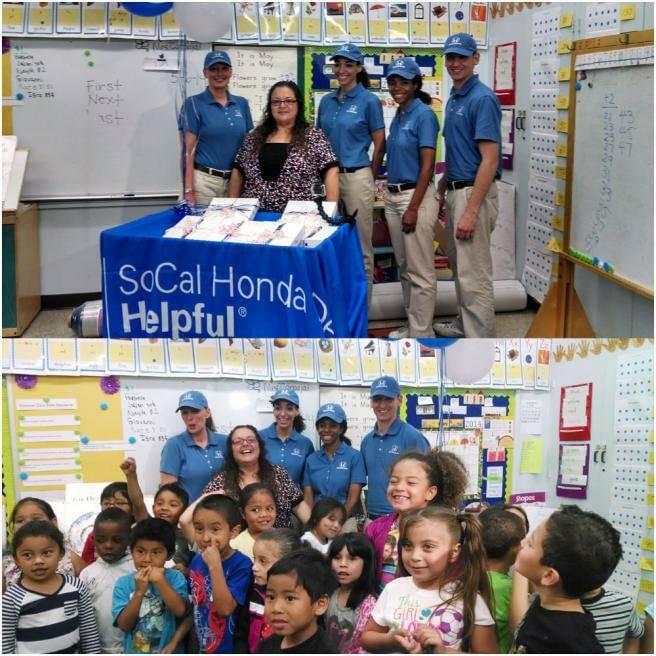 During Teacher Appreciation week, May 5th – 9th, the SoCal Honda Dealers and the Guys in Blue stopped in at schools in San Bernardino, Granada Hills, Huntington Park, Carson, and Anaheim to honor five of the most deserving teachers across the region. The Helpful Guys presented each teacher with $5,000 in much-needed resources off of their classroom wish-lists. Gifts included updating classroom technology with Chromebooks and iPads, a field trip fund, important developmental materials for a special education class, forensic science equipment, and other helpful school supplies. 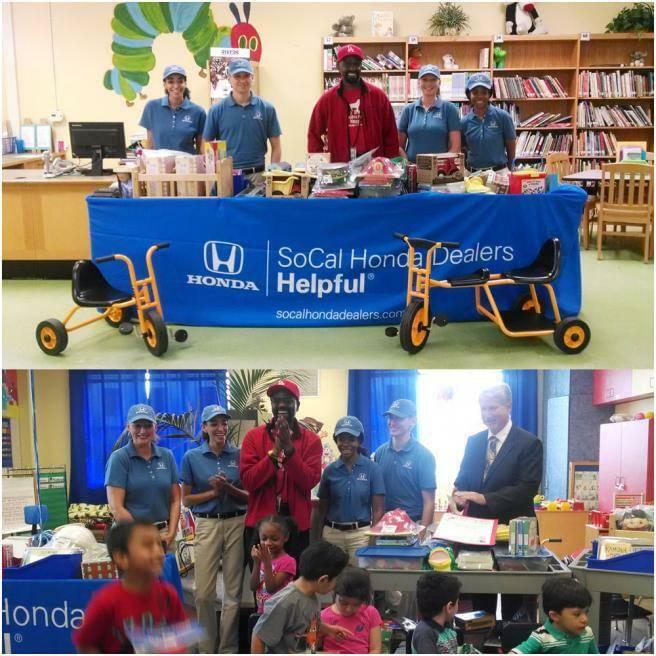 The week kicked off at Pacific Blvd Elementary, where Mr. Bill Mitchell was surprised during his class by the Guys in Blue wheeling in carts filled with educational games, books, and interactive software. A pre-school special education teacher, Mr. Bill spends his own money and time well beyond the classroom to create stimulating learning environments for his students, to provide parents with resources for child development at home, and to teach the general student population about special education and full integration of all students in the school and in the community. On Wednesday, the helpful team celebrated Mrs. Laura Castrejon, a 4th grade GREAT teacher at Alexander J. Stoddard Elementary, who is described by her peers as a teacher who is “innately great at teaching. She has the art of teaching, not just the science” – Principal Dale Hillver. Mrs. Castrejon makes it a priority to incorporate art and community services into education; a class project mailed 1,000 cranes to the Sadako Sasaki peace memorial in Hiroshima, while another involved selling original origami cranes to raise money for donations to the CHOC. She also organizes school-wide campaigns such as “No Name Calling Week” and “Stand Up to Bullying” that are both now annual events. She was gifted with chromebooks and art supplies to further student learning and projects in her classroom. Thursday morning started off gifting forensics science equipment to Mrs. Lynette Ryan at the Valley Academy of Arts and Sciences, where Mrs. Ryan herself developed the science program through hours of volunteer work. She now teaches Environmental Science, AP Environmental Studies, and Forensics, while still somehow finding time to be the Community Arts and Sciences liaison, as well as the Aspen Team coach. 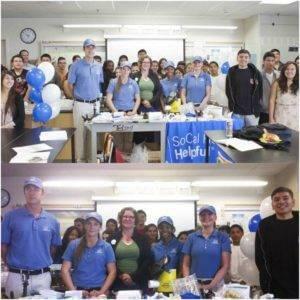 Mrs. Ryan has forged many partnerships with local organizations – colleges that work with her students in AP readiness programs; non-profits where her students harvest food and put on “Healthy Kids” programs for community centers (which helped her Aspen team win the LAUSD competition this year to move on to the Aspen ideas fest); and many more programs that have all inspired a passion in her students for science and learning. The last stop of the week was San Bernardino High School, where Mr. John Hinklemanteaches AP US History. 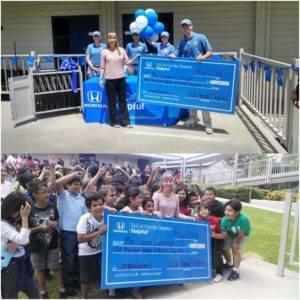 The Guys in Blue surprised him at the Annual Teacher Talent Show that he co-created to raise money for AVID and cross country, which he coaches. A lead Linked Learning teacher, Mr. Hinkleman works closely with at-risk kids to guide them to graduation. Student Kimberly Gonzalez says, “we live in this tough neighborhood, and he believes we can do so much more.” “Hink,” as he is fondly referred to around campus, has created various other programs such as Block S, a club which instills a sense of service and citizenship by encouraging athletes to volunteer in the community, “Hinkleball,” an interactive game used to help students prep for tests, and the Law & Society Academy, which guides students to careers in law, politics, and social work. 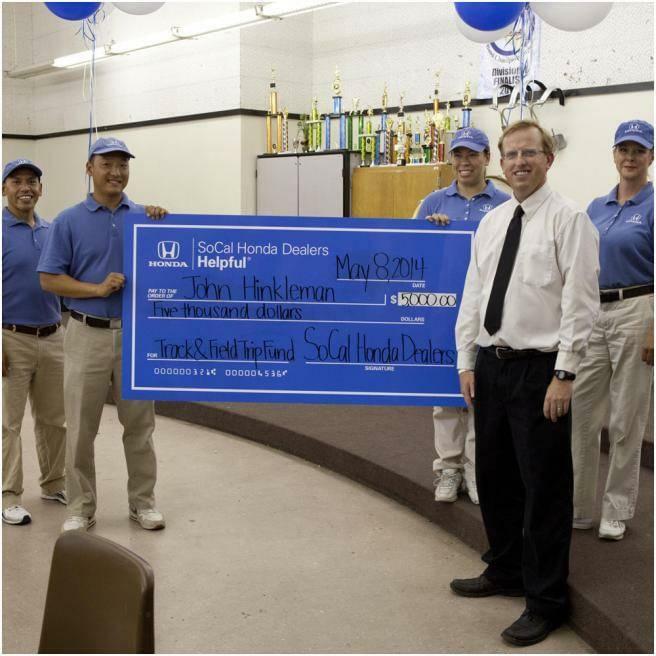 The SoCal Honda Dealers provided Mr. Hinkleman with a field trip fund for events for his students, and custom tshirts for his cross-country team. Celebrating teachers who give so much to their schools and students is just another way the Guys in Blue are helpful in the community. 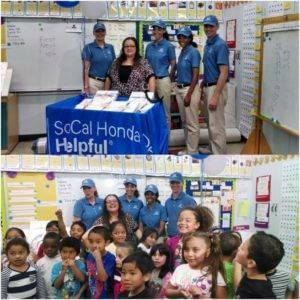 To find out more about Helpful Honda’s 2014 Teacher Appreciation efforts, visit https://youtube.com/SoCalHondaDealers . For clues on where you can find the Guys in Blue next, ‘Like’ us at facebook.com/SoCalHondaDealers and follow us on Twitter @HelpfulHonda .